Team 8-1 students at Heineman Middle School raised more than $5,000 for charities through projects completed for “Heineman Apprentice” this spring. 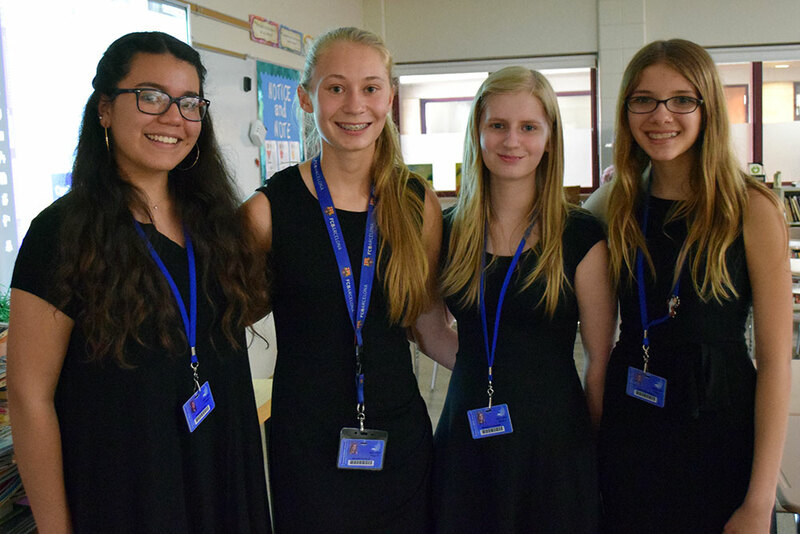 The Apprentice project has been held in literacy and social studies classes for the past several years, teaming students together in small groups to discover, research, and support charitable organizations through class presentations and fundraising. The project creates a powerful learning opportunity at many levels. Students collaborate on their projects, building valuable analytical, research, and rhetorical skills, while at the same time becoming more aware of organizations serving populations with experiences far different from their own. In addition, classmates benefit from learning about each others’ projects through presentations. According to Cravens, student feedback about the project is overwhelmingly positive. Students enjoy connecting with “real-world” issues, people and organizations, and using their skills to make a tangible difference in the world. A number of groups expressed that they identified so strongly with their organizations’ missions that they plan to continue working to support them independent of school. Students Angie Favila, Rachel Carlson, Natalia Furmanek, and Holly Holterhaus raised donations and awareness for Cradles to Crayons. Another group raised more than $230 in cash and donations for Animal House Shelter, a no-kill animal shelter in Huntley. Student Kyleigh Higgins said she enjoyed meeting with local and national businesses to garner support for the cause, making a tangible impact for an organization whose mission she cared deeply about. 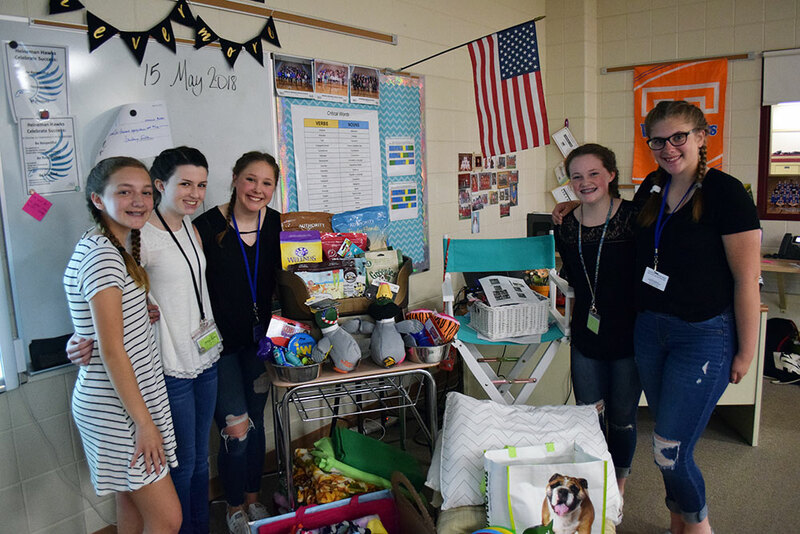 Students Kyleigh Higgins, Jessica Adams, Addy Schiltz, Ashley Foster, and Jenna Petryniec raised cash and supply donations for Animal House Shelter. Ava Brancato’s group raised more than $1,000 for the Make-a-Wish Foundation. Group members said they selected the organization in part because the joyous impact it makes on individual recipients is so apparent. In total, the groups raised a $5,611 for their causes. In addition, they raised awareness both among their classmates and the larger community through their out-of-class work and in-class presentations. Students receive promotional materials from a group during a Heineman Apprentice presentation. “The students engage with enriching and authentic learning experiences, outside the classroom walls and beyond their Chromebooks. 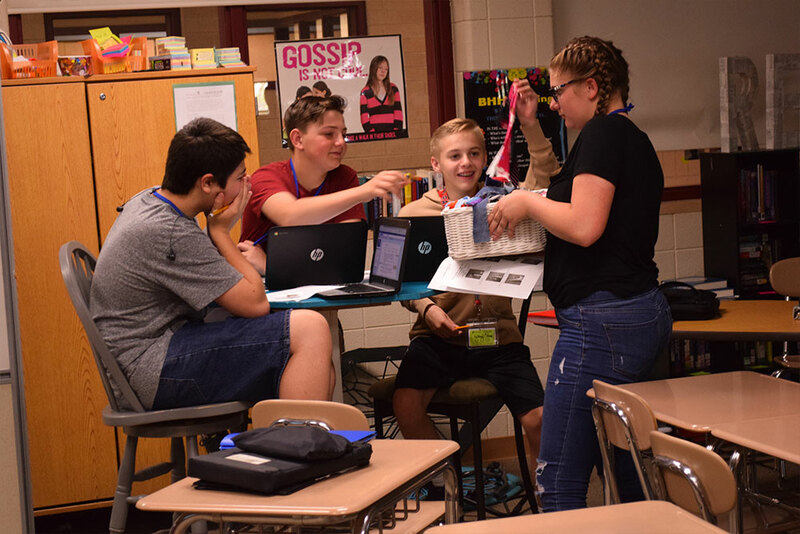 I think 8th graders love the trust and respect they are given as they make this leap into deeper understandings of the world around them, while also adhering to the guidelines and essential learning standards of the project,” Cravens said.